More often than not, if I don’t like a film that is already bring jeered in the internet cinephile community, I let it slide without writing anything on the blog. I take no joy in piling on any film. Such was the case with Tom Hooper’s Les Misérables. Though it has its fair share of fervent supporters too, I think it’s safe to say the musical doesn’t need any more negative press. That’s not to say I think it didn’t deserve that negative response; I personally thought it an atrocious piece of filmmaking, an incomprehensibly ill-conceived directorial feat that failed to convey the novel’s broad political ideology and emotional impact. The performances were problematic and misguided by Hooper’s balls-to-wall, faces-right-in-your-face approach and the editing felt jumpy and pressurized the audience further into Hooper’s intense and overbearing visual scheme. As I already noted though, I really don’t want to beat a dead horse. But I’m bringing this up because the film’s Oscar win for best sound mixing prompted me to think about how that element of the film affects the whole enterprise. The mixing became the biggest story of Les Misérables, so much so that the mainstream media that usually pays no attention to crafts work picked up on it and the live recording of the music became the narrative for the film’s awards campaign. It was also a talking point in discussions about the strength of the performances: Anne Hathaway didn’t just belt ‘I Dreamed a Dream’ in one take, but she did it live! I’ve written several times before on what I generally think constitutes great below the line work in films, most recently in my countdown of 2012’s best crafts works: it’s as much about the service it does to the film as it is about the quality of that element individually. This is even true when a film entirely relies on a certain aspect of its craft work. James Cameron’s Avatar, for example, is undermined by overly pronounced themes and simplified politics, One can argue that the wizardry that allowed the film to be made isn’t in service of the narrative, but overshadows it. But even then, it’s hard to argue with the fact that visual effects are in service of the holistic enterprise of Avatar, for without them how could the universe be created so effectively? Cameron clearly had a vision, with which the designers and the film’s story all work in tandem. So the question I’ve had regarding Hooper’s film is, how much, if at all, does it benefit from the live recording? And when I talk about that I’m not necessarily bringing the Oscar winning work into the question because a large portion of the mixing process is performed during post-production and the sound designers did a terrific job there. But does the decision to record the music live serve the film at all? I think it doesn’t actually. One assumes this method of sound recording is what necessitates the continuous use of closeups because the logistics of filming don’t allow for photographic flexibility otherwise. Would Hooper have chosen to film Les Misérables exactly as he has now if it weren’t for live recording? Perhaps. It’s presumptuous of me to think otherwise. And who’s to say that the decisions didn’t go hand in hand in the first place? The cinematographic choices might have been part of the film’s original conception, as opposed to an offspring of the logistics dictated by sound recording, but I have a hunch that certain sequences – most glaringly the love triangle – were shot in closeups particularly because of the inability to capture it any other way without disrupting the geography of the sound work, and that’s a decision that seriously hurts the film. 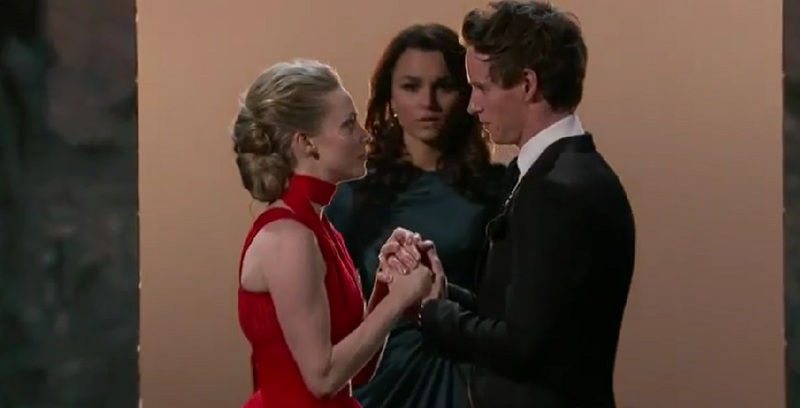 The Oscar telecast featured a live performance by the cast of the film that displayed, in a mere second, something the film couldn’t convey over several minutes during a pivotal sequence where Redmayne, Seyfried and Barks sing together a conversation that reiterates their emotional connection with one another. In the telecast, Barks enters the stage from behind the two lovers as they hold hands and looks longingly at them as she sings her lines. By contrast, the film establishes no spatial relationship between the three of them, cutting from closeup to closeup as they each sing their lines. Is that an intentional decision by Hooper to separate the love triangle, or is it enforced by the requirements of recording the film live? Either way, I think his stylistic choices are inexcusable. This sort of visual stiffness is only one of many problems I had with Les Misérables, but I think the complete emotional disconnect I felt with the film would have been pacified if the formal approach to the inherent grandiosity of the musical had been a bit tenderer.